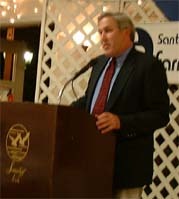 Our Co-President Kirk Schmidt was named Santa Cruz County Farmer of the Year, 2003. This was in fact Kirk's second farmer of the year award, the first in 2000. Along with a host of commendations, our current governor, Gray Davis, also legally made Thursday July 17th Kirk Schmidt Day, at a small tax payer expense. Over the past several months Quail Mountain Herbs has been expanding our specialties line of fresh culinary herbs. Eighteen different fruity mints such as lemon, lime, orange, pear and pineapple will inspire every chef. A garnish pack of scented geraniums features frilly leaves and spicy scents including cinnamon, ginger, peppermint and rose. Seven different lemon herbs, seven different thymes, and six sages, as well as international flavors like epazote, hoja santa, kaffir lime leaves, red shiso and Vietnamese coriander are only some of the exciting new fresh herbs.